Some brothers spend their time tormenting each other or fighting over the front seat. It might seem as if teenage brothers getting along in peace and harmony will only happen right after pigs learn to fly a stealth fighter, but this isn’t the case in Eddy County. Brothers Tylar and Jacob Colwell of Carlsbad not only get along, they operate their own business, raising steers, lambs, rabbits and pigs they show at local events each year. The Colwells compete in county fairs and sell their award-winning animals, and they were eager to discuss the success of their breeding operation. Tylar and younger brother Jacob, 16, started seven years ago with just one sow. Now, they have 23 hogs and sows, 10 cows, eight sheep, two boars, and 74 piglets. One of those sows is about to deliver a litter. With the help of their family, the brothers recently built a 30-by-40-foot barn and an eight-crate shelter for farrowing. Trammell has serviced the Colwells’ loans since the brothers walked into the Roswell FSA office. The two have been using an annual operating Youth Loan from the FSA for the last five years. Youth loans are available for young farmers between the ages of 10-20 years old with a maximum loan amount of $5,000. Borrowers must be U.S. citizens or legally-admitted, resident aliens with permanent status, and provide a supervised operating plan. The Colwell brothers use the money to purchase equipment, feed and animals. Loan funds also can be used for seed, supplies, rent, or equipment repairs and other operating costs. 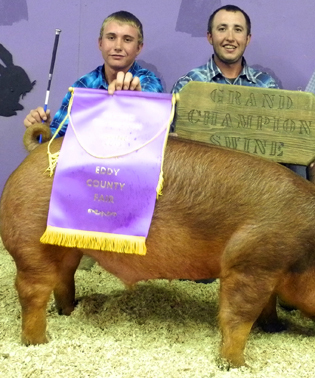 Last year, Tylar raised a Hampshire pig that was honored as “Best in Eddy County,” at the Eddy County Fair, and Jacob had animals win Grand Champion in Eddy County, Grand Champion at San Miguel in Mora County, and Reserve Grand Champion in Harding County. They received more than just blue ribbons – those prized animals brought in green cash, as well. Jacob stressed “responsibility” more than any other principle in regard to his family and business. This principle is linked to their success in competition as well as paying off their loans and staying in good standing with FSA. The Colwells experienced a few challenges, including some losses, in the beginning, but they bounced back after getting guidance from seasoned breeders and farmers. Some of that assistance the boys attributed to the FSA loans, which both admit strengthen their financial credit and reinforce the strong sense of “responsibility” their mother, Donna, instilled in them. To learn more about the FSA Youth Loans, visit www.fsa.usda.gov/youth-loans.